How hungry are we for delivery service? So hungry that you can now have a Christmas tree delivered to your home by DASHED. Better known for bringing restaurant grub to your doorstep, DASHED is changing our notions of what should be delivered and how it should get there – though nibbling on spruce needles is still not recommended. the challenge to do it better than anyone else. 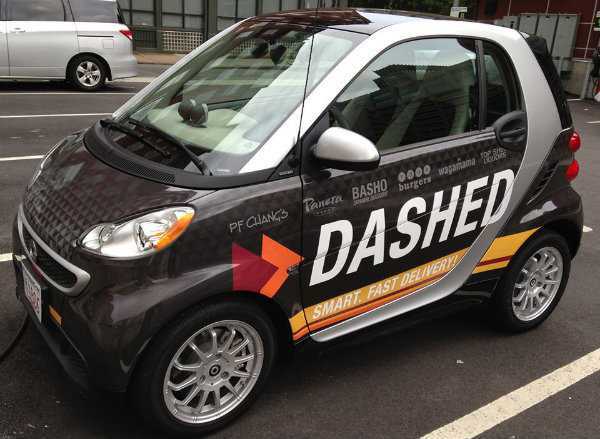 We’re a delivery service named DASHED. Speed is (basically) our name. Since starting the company on my bike, we’ve stayed true to this core mission of delivering faster: today, 25% of our deliveries are still done by bikes and scooters. More recently, we were the first in our industry to roll out a fleet of electric and eco-friendly SmartCars for our carriers. Anyone who is in our approved carrier pool can rent a SmartCar for an 8-hour shift, like a Zipcar, to earn cash by making deliveries. Over 75% of our deliveries on any given night are done by SmartCars, bikes, or scooters – making us the fastest, most nimble, and greenest delivery service in our space. It’s not how hard you work, it’s how smart you work. Spend your time working on the things that matter. Just because you spend half the day working on something, that doesn’t mean it’s important or the right thing to be working on. It may be a giant waste of time. Think about what truly drives your business and spend your time on that. One of the more surprising things is just how much people love delivery. It turns out that I’m not the only person who wants just about everything delivered. We started to tap into our pre-existing, already-trained staff to deliver things other than food – like beer, wine, liquor, convenience items, flowers, bakery items, produce. The results have far surpassed my expectations. However, the runaway hit this year, by far, is our white-glove Christmas tree delivery. Who would have thought? It changes the way you look and do everything. You’re no longer an actor, you’re the director. For better or worse, it’s almost impossible to NOT start seeing business opportunities and ways to do things better in everyday life. Minor frustrations that you experience when you’re out and about, instead of just complaining about them, will make you question things: How would I do this differently? Am I the only person who would appreciate doing it this (better) way, or is there a real need for this? I like to run, so I’m training for some international marathons. When I want to slow things down, I write or do yoga. Playing with my dogs always brings a smile to my face, and skiing is one of my favorite things to do in the world. New York has it all. I’m not heavily involved in the tech scene here, but I’d be surprised if it weren’t awesome. By introducing me to good, smart, motivated people.